Confession: There really isn't such a thing as Ham Hock Appreciation Day, but, by golly, there should be. Ham hocks, dollar for dollar, pack some of the most power in the kitchen. Indeed, if there were nominees for the category of "Ingredient You Don't Know -- But Should," the winner would be the lowly (literally) ham hock. To wit: What other element can flavor greens, green beans, soups and slow-cooked beans as well as a hock? For about $1 per hock, you can season a week's worth of beans or greens. Their storage time is legendary. Ham hock originates in the lower rear leg (or ham). Ham hocks are most often available cured. Thanks to its abundance of connective tissue, hocks provide a rich, smoky flavor that is ideal for flavoring soups, stews and rustic vegetables. What some people don't know, however, is that after the ham hock has given up its seasoning joujou, then the meat can be diced and turned into a tasty, cheap entree. Get a slab of corn bread, and you're good to go. Sort and wash beans; place in large Dutch oven. Cover with water 2 inches above beans. Bring beans to a boil and cook for 2 minutes. Remove from heat, cover and let stand for 1 hour. Drain beans and set aside. Sprinkle 1/2 teaspoon seasoned salt over sides of ham hocks. Heat vegetable oil in Dutch oven; cook ham hocks 3 minutes on each side to start rendering the fat. Add reserved beans, remaining seasoned salt, onions, thyme, bay leaf and pepper and stir to blend. Bring mixture to a boil. Reduce heat and cover; simmer 2 to 3 hours or until beans are tender. 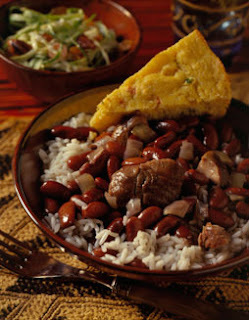 Remove bay leaf and serve beans over rice. The recipe looks more complicated than it is, and it does have a few steps. However, it's perfect for a dinner gathering because it can be made two days ahead of serving time and then assembled and baked the day you need it. In a busy world, that's gold. My experience has been that this actually is better served the next day, so do take advantage of this convenience. Preheat oven to 325. Melt butter in large ovenproof pot over high heat. Add onions and next 3 ingredients; sauté until vegetables are soft and golden, about 7 minutes. Add wine and next 3 ingredients; stir 1 minute. Add chicken broth and ham hocks. Bring to boil; cover and bake until ham hocks are very tender, about 1 hour. Cool. Preheat oven to 350. Bring chicken broth to boil in large saucepan. Gradually whisk in grits. Add 2 teaspoons minced thyme. Reduce heat to medium; simmer until grits are thick and smooth, whisking frequently, about 7 minutes. Stir reserved ham, Fried Apples (see below), and 1 cup cheddar cheese into grits. Transfer mixture to 13x9x2-inch oval baking dish. Sprinkle with remaining 1/2 cup cheese. Bake until cheese is golden, about 30 minutes. Rewarm ham hock broth. Garnish grits with chopped thyme and serve, drizzling broth over. This is a European classic. And, hello, it calls for ham and butter. Melt the butter in a Dutch oven or large, heavy saucepan. Cook the onions about 5 minutes, until they are soft. Add the hocks and potatoes, then pour on the remaining ingredients. Cover and simmer about 1 hour or until the meat falls off the bone.